"Privat" Hotel is located near the center of Donetsk. It offers 5 double comfortable rooms to maintain homelike atmosphere and comfort. All rooms are equipped with all necessary furniture, air conditioning, TV and fridge. Free Wi-Fi is available. There is a kitchen, equipped with everything necessary for cooking on the 1st floor of the hotel. Hotel provides guests with home appliances (iron, ironing board, hair dryer) if needed.There is barbecue in the inner courtyard. Free parking is available. Distance to the train station is 7.9 km, to the bus station - 3.6 km. 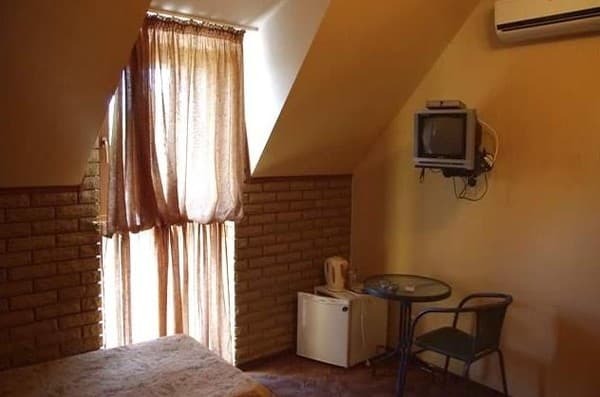 Description of the room: Cozy 1-room apartment, which has all the necessary attributes for a comfortable stay: 2 beds, table, chairs, bedside table. Description of the room: Cozy apartments, located 200 meters from the hotel, with an area of ​​50 sq.m. Consist of 3 rooms. Kitchen-studio with all necessary attributes for a pleasant stay, sofa, built-in kitchen. 2 bedrooms with 2 beds. The following amenities are also at your disposal: automatic gates, video intercom with electric lock, covered parking for 2 cars, cozy patio, BBQ. Possibility of accommodation with children and provision with extra beds you can specify when booking. 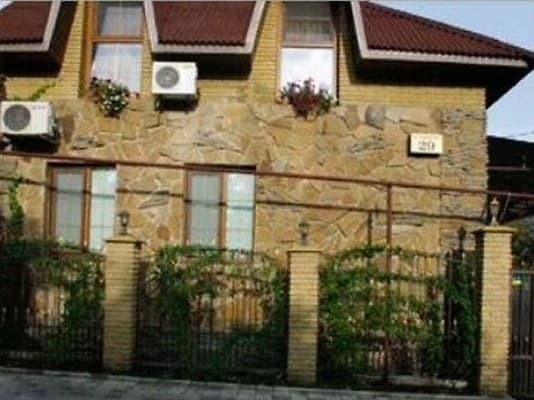 "Privat" Hotel is located near the center of Donetsk on the Panfilov avenue. The main infrastructure is located nearby. The cafe "Plakuchaya Iva" and Bakinskikh Komisarov square are located close to the hotel. Distance to the train station is 7.9 km, to the bus station - 3.6 km. To reach the hotel from the train station you can take shuttle bus №100, 11Б, 23 and bus №30 to the stop "U Lukomorya", the café is nearby. The hotel is 20 m away from the stop.